Pure-Fit Sterile Connectors incorporate the Pure-Fit SIB technology, to create a true sterile connection & maintaining complete fluid integrity. Pure-Fit SIB Hose Barb Fitting from Saint-Gobain is a smooth inner bore (SIB) fitting and assembly system that provides a seamless transition between tubing and fittings, maintaining complete fluid integrity throughout the system. Pure-Fit SIB’s unique internal design reduces the risk of tubing being punctured or cut from sharp, barbed edges like those on traditional fitting systems. 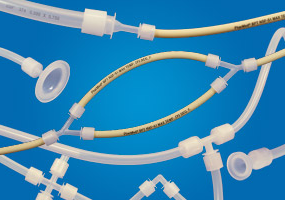 Available in both animal-free polypropylene (PP) and polyvinylidene fluoride (PVDF) materials, Pure-Fit SIB provides a seamless transition that maintains complete fluid integrity when used with Saint-Gobain’s Sani-Tech, C-Flex and PharMed flexible tubing. Pure-Fit SIB fittings are fully compatible with Pure-Fit and BarbLock retainers that provide complete 360° compression for leak-free connections. Pure-Fit SIB fitting systems meet all USP Class VI and ISO criteria and have been physically tested to meet the most demanding applications and stringent test protocols. To further discuss the Pure-Fit Hose Barb Fitting, and how we can help you. Please contact us, or request a callback at a convenient time to suit you.